This modern Superior Shed in installed for storage of gardening equipment and is part of our broader range of timber storage sheds. As part of our service, we include free delivery and installation by our dedicated Installation Team, who will make sure your garden building is set up perfectly before they leave. The exterior shiplap cladding was coated in Slate Valtti paint, proven to be the best possible protection for exterior timber. This was teamed with cedar roof shingles and guttering to collect run-off water. Crane Garden Sheds stand out among the variety of wooden sheds available on the market today. 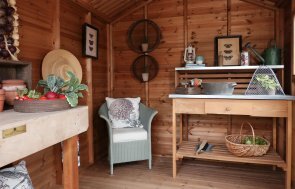 Handmade to order in our Norfolk based factory, each custom built shed is made from sustainably sourced FSC® certified Scandinavian Redwood.